How bad is the “Patrick Lite” bathroom bill? A review of press coverage shows that the Texas “bathroom bill” debate generated $216 million in publicity for the state of Texas in the period from January 10, 2016 through May 22, 2017. 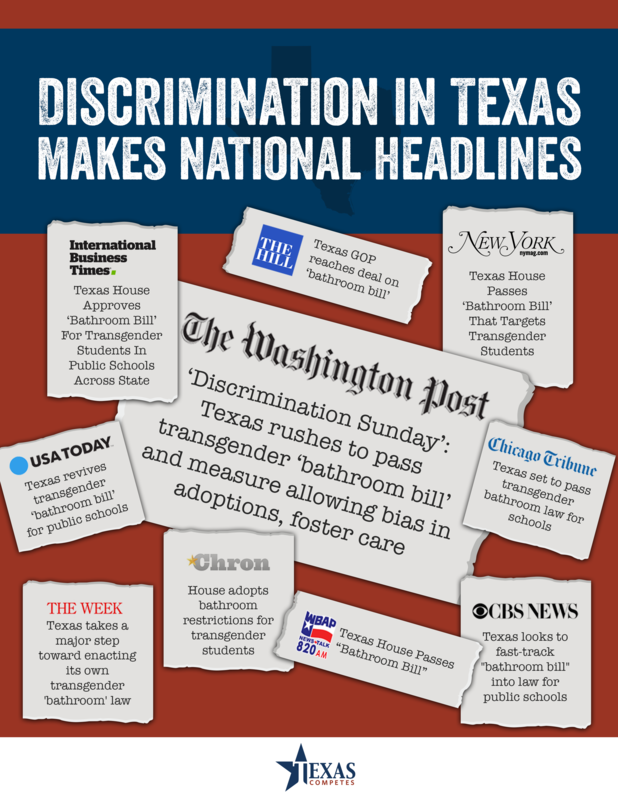 During the 85th Texas legislative session, 25,774 local, state, and national articles were written about the efforts to pass bathroom and changing room restrictions on transgender adults and children. More than 20,000 of these articles were published outside of Texas. You know how they say there’s no such thing as bad publicity? This will be a test of that. And I’m sure North Carolina’s glad we’re getting all the attention for being transphobic and unwelcoming now. It’s taking some of the heat off of them. As bad as the perception is, the reality may be somewhat less harsh, though that remains to be seen. “I think it’s going to depend on how people interpret the amendment,” said Dax Gonzalez, assistant director of governmental relations for the Texas Association of School Boards, which represents the state’s school districts and provides guidance to them on policies related to transgender students. “I think what it boils down to is that this amendment is pretty flexible and open to interpretation,” Gonzalez added. School groups agree because providing single-stall facilities for students seeking bathroom-related accommodations is something school districts “would do anyway,” so the amendment doesn’t make a “significant change” on that front, said Jennifer Canaday, governmental relations director for the Association of Texas Professional Educators. When it comes to the amendment’s possible effects on efforts to accommodate transgender students beyond single-occupancy bathrooms, Canaday echoed the school board association in saying there was “enough ambiguity” in the amendment to allow for different interpretations by school districts. But she indicated that the school group — which deemed bathroom-related legislation “a solution in search of a problem” — was still sifting through any possible repercussions for trans-inclusive policies in place across the state. I strongly suspect that more forward-thinking districts like HISD will continue to accommodate trans students as best they can, while districts with jerks for Superintendents like Pearland ISD will take a hard line. It will inevitably be up to the courts to sort it out. One major danger zone in all this is privacy concerns. Even if this law isn’t quite as bad as it could be, given its limited reach, it’s still potentially catastrophic for thousands of children. Not everyone is out, and not everyone wants to be, but what is a school to do with a trans kid who doesn’t want his or her classmates to know about that? Trans kids are already at an elevated risk for suicide. When something bad happens, don’t say we weren’t warned. The DMN, Burkablog, and Deadspin, both of which note the lack of any response so far from the NCAA, have more. UPDATE: The Senate will reject the “Patrick Lite” amendment in SB2078. Nothing good can come of this. So would the rest of us, Your Honor. In his first major appearance since finding the Texas school finance system unconstitutional in 2014, state District Judge John Dietz said Sunday that a solution to the state’s unequal and ineffective public education system should come from the Legislature. In his decision last September, Dietz ruled in favor of more than 600 Texas school districts that brought the case. The districts, which serve three-fourths of the state’s estimated 5 million public school students, argued that the state is not meeting its constitutional obligation to adequately fund public education. 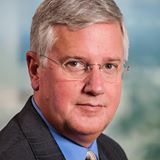 Dietz’s comments were met with applause at a training hosted by the Association of Texas Professional Educators – the largest independent teachers’ organization in Texas, and the largest of it’s kind in the United States, with an estimated 100,000 members. Then attorney general, now Gov. Greg Abbott attempted to remove Dietz from the case last year, questioning his impartiality based on a series of emails between the judge and school district lawyers. But at ATPE, lobbyists remain optimistic that Abbott will work with them to solve problems affecting public education. I’m glad they’re optimistic – I guess anyone can look good compared to Rick Perry – but color me skeptical for now. Abbott did defend the 2011 cuts in court, then declined all calls to settle after Judge Dietz’s ruling, preferring instead to draw this out by appealing to the Supreme Court. And even if you do have faith in Abbott, Dan Patrick gets a say in this, too. He thought those 2011 cuts were a good idea. Given a choice between these guys coming up with a solution and waiting for the Supreme Court to impose one, I’ll take my chances on the latter. Senate budget writers have enjoyed praise from conservatives for their focus on tax cuts, but they’re about to get an earful from educators who think their promises could cost Texas public school students. The starting budgets of the state House and Senate, released last month, are similar on many fronts, but not with respect to education. Faced with $4.5 billion in additional revenue from increasing property values, the House has chosen to reinvest a portion of that in public education while the upper chamber is focusing on tax relief, a decision not sitting well with educators. A cursory glance at the Senate’s document indicates the upper chamber wants to provide billions more this biennium for public education funding. But the promises of many senators, including new Finance Committee Chair Jane Nelson, to provide $4 billion in tax relief leave only around $200 million available for schools. On the House side, budget writers have pledged to funnel $2.2 billion of the property value growth revenue into public education. The money comes with strings attached, but education advocates say the decision to re-invest this money into education shows the lower chamber’s commitment to meet the needs of schools. Good luck with that. Look, the Republicans were clear on what their priorities were. Public education was not high on the list. If there’s a few bucks left over after tax cuts and border security and roads and maybe some other tax cuts, then sure, whatever. If and when the Supreme Court forces them to spend more on education, then they’ll deal with it, as minimally as they think they can get away with. But until then, this is what we elected. EoW and Better Texas Blog have more. Back in 1984, one of the school reforms that resulted from the Perot Commission was a mandate that elementary school classes could have no more than 22 students in them. Many things have changed since then, but that standard has remained. Now it may be a casualty of the current budget crunch. Any statewide change in the standard could translate into hundreds of millions of dollars for the state and districts. The 22-pupil limit is costly because every time a class in the five affected grade levels hits 23 or more students, a new class must be created with an additional teacher and classroom. 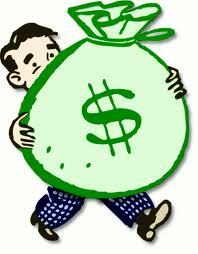 One superintendent from the Houston area said each new class costs his district $100,000 to $150,000. Superintendent David Anthony of the Cypress-Fairbanks school district also said his district added more than 70 classes last year. The legislative committee’s recommendations could loom large as lawmakers grapple with what is expected to be a record revenue shortfall approaching $15 billion. About 60 percent of the state’s general revenue funds are spent on education. The leaders of the special committee – Sen. Florence Shapiro, R-Plano, and Rep. Rob Eissler, R-The Woodlands – said class size standards will be scrutinized. Shapiro and Eissler also chair the education committees of their respective chambers. Eissler said he understands, though, why teachers would be reluctant to see any change in the standard. Teacher groups also point out that school districts can get waivers to be exempted from the 22-to-1 limit if they claim they lack classroom space or can’t find qualified teachers for additional classes. But superintendents dislike the requirement that they must notify parents whenever they seek exemptions for larger classes and in some cases must hold a public hearing. This school year, 144 districts received waivers from the state that allowed larger classes at 544 elementary schools. The Dallas school district had waivers at 31 campuses. In all, nearly 1,800 classrooms – with almost 40,000 students – had more than the maximum number of pupils this year. “The Texas Education Agency never denies waivers,” said Josh Sanderson of the Association of Texas Professional Educators, insisting that school districts don’t need to have the class size rule changed because they can get exempted from it when necessary. There’s certainly room to argue over whether or not the 22-1 ratio is the difference-maker it was when it was first adopted. As Rep. Eissler points out, the right answer if you really want to improve classroom performance would be to reduce the teacher-student ratio even further. It’s likely the case that there are more cost-effective solutions for achieving that improvement, but that is a known solution. Allowing the ratio to be increased instead as a cost-cutting measure is just another reminder of what our priorities are as a state, and a reminder (as if we needed one) that the school finance question still hasn’t been answered. We do know how to do things more cheaply, because we’ve had a lot of practice with that. We’ll be doing it again soon. Doing things better never seems to be more than a theoretical option.